I'll be straight with you—I've always had pretty white teeth. Personally, I blame it on genetics (my dad has freakishly white teeth) and an undying commitment to my go-to whitening toothpaste and coconut-infused mouth rinse. Recently, however, I'd noticed a tad more yellow than I was used to, so when I was offered an appointment with celebrity cosmetic dentist Kevin B. Sands, DDS, I jumped at the chance. Not only was I excited to regain my pearly white brightness, I was also pretty jazzed to get some helpful tips and tricks from the man behind some of Hollywood's most enviable smiles. To give you an idea, Sands caters to the Kardashians, the Jenners, Miley Cyrus, Emma Stone, and Justin Bieber, just to name a few. Tucked in the beating epicenter of Beverly Hills, Sands's office is everything you'd expect from a celebrity dentist, (i.e., I was greeted by an amazingly hospitable staff, sparkling, state-of-the-art technology, and monogrammed water bottles) as I snuggled into the waiting room's plush sofa, I couldn't help but feel excited, and was anxiously anticipating my results. Not surprisingly, one hour later I walked out of the office with a significantly brighter smile in addition to some helpful takeaways on the topic of whitening. From diet tips to product recommendations, keep reading to find out everything I learned about whitening from a celebrity dentist. According to Sands, there are certain things to keep in mind before you whiten, regardless of whether you're using an at-home system or going in for an in-office treatment. Luckily, his list is short and sweet. First things first: Sands recommends getting your at-home hygiene on track. Though he says it's a myth that whitening treatments wear down the tooth enamel, it's still good to go into the treatment with your best mouth forward. Therefore, ensure your brushing, flossing, and rinsing game is *especially* on point in the weeks and days leading up to the whitening treatment. It's also not a bad idea to go in for a professional cleaning, says Sands. Pro tip: Whitening treatments are safe for most people, but Sands tells me those who are at risk for increased sensitivity (such as kids and pregnant women) should tread carefully and all ingredients used should be discussed before-hand with a dentist. So you've decided you want to whiten your teeth, but what now? With so many whitening products and procedures available both in-store and in-office, it can become intimidating to choose a method that's easy and effective. For results with true staying power (at least a few months), Sands says in-office whitening treatments (like Zoom, the treatment I received) typically yield the best, brightest results. However, whitening trays made by your dentist and whitening strips can be great alternatives—just remain diligent with your use and ensure you follow the product's exact application instructions. For instance, if it recommends to use every day for a week, use it every day for a week. Applications few and far between won't have the same, sparkling results. Overall, Sands says preserving results shouldn't be too difficult. Brushing, flossing, and rinsing on the regular with quality products (we'll get to our favorites in a few) is the best way to keep pearly whites extra bright. And again, he recommends going in to see your dentist about those regular teeth cleanings. (Do we sound like a broken record yet?) However, he did warn that diet can also play a factor. Which, though it makes sense, caught us a little off guard. While we've been taught to supplement our diets with foods boasting hues of the rainbow, Sands says regularly noshing on dark or ultra-colorful fare is actually one of the worst things you can do if you're trying to maintain your teeth whitening results—whether you've committed to at-home treatments or received a treatment in-office. And while we could probably live without soda (one of the worst offenders for discoloration), it just doesn't seem realistic to delete healthy additions like berries and even coffee, from our diets entirely. So what's the solution? According to Sands, we should try to balance the colorful foods in our diet with calcium-rich options like milk and hard cheeses (music to our ears) and even things like hard fruit, which he says will "help cleanse the teeth as we chew." Love your morning mug of java? Try following it up with an apple to negate the possibility of stains or even just swishing your mouth with some water. Some other diet and lifestyle factors Sands brought to my attention also included: smoking, drinking, and personal hygiene (e.g., not brushing or flossing.) It's not hard to guess that smoking has a less than satisfactory effect on our pearly whites, and as far as drinking, well, blame it on alcohol's high sugar and acid content. To soften the blow, Sands suggests drinking through a straw instead. Keep scrolling for some of our favorite tried-and-true whitening products! 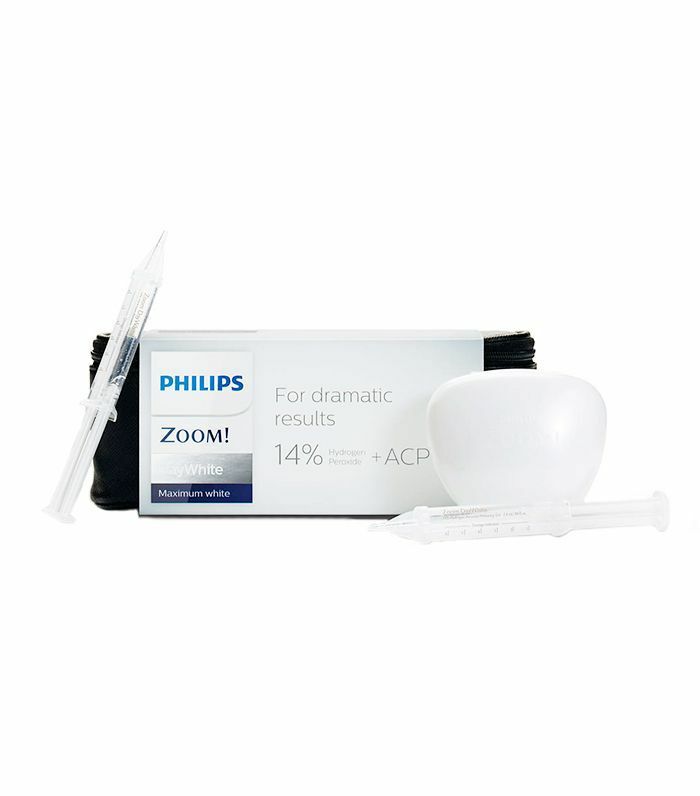 These syringes filled with high-performing whitening gel feature a fresh minty flavor and arguably superior brightening results compared to some of the brand's competitors. 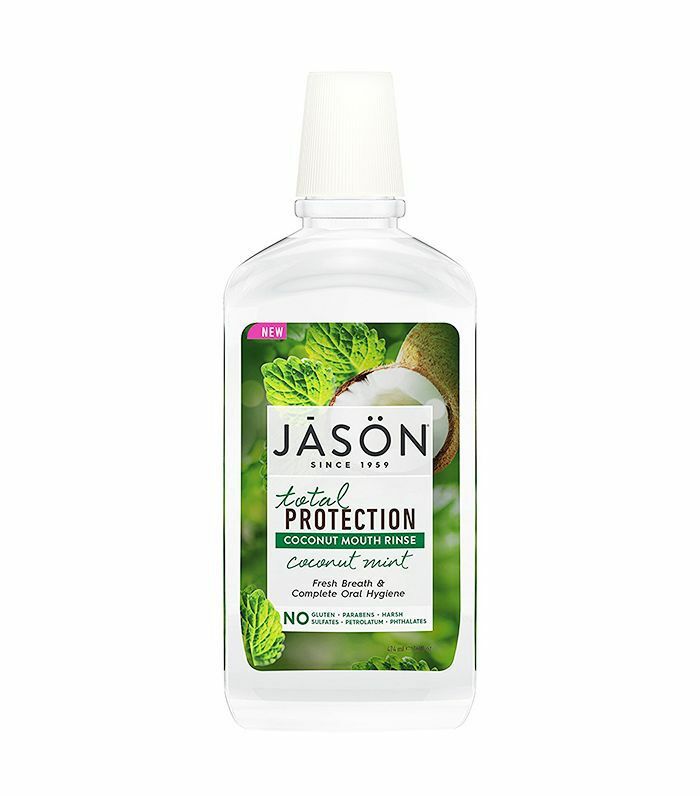 This brand is Sands's professional pick, and despite the admittedly intimidating appearance, it's an easy, effective at-home option. Enriched with bacteria-fighting botanicals and coconut oil, just 20 seconds of swishing this all-natural formula keeps gums and teeth happy, healthy, and bright. It's especially wonderful if you're prone to sensitivity as it never incites the dreaded burning effect of so many other mouth rinses on the market. Yes, this may be the Rolls Royce of all toothbrushes, but considering its long-term health and whitening benefits, we deem it a worthwhile investment. Here's the breakdown: 40,000 vibrations per minute, three different electronic modes (massage, whitening, and cleaning), and timed brushing intervals so you never cut yourself short. Oh, and it also looks pretty stellar when displayed on a vanity. Just like natural skincare and makeup products, it can be hard to find a natural toothpaste that truly sings—in other words, one that works as well as its not-so-natural counterparts. Adorable packaging aside, Hello toothpastes are the real deal, free from artificial sweeteners, dyes, artificial flavors, microbeads, triclosan, gluten, saccharin, and peroxide. This pick is especially great for your teeth brightening goals and boasts enamel-strengthening, breath-freshening, and anti-cavity benefits as well. Surprise: Coconut oil–enriched floss is very much a thing and an incredible tool if you're one (of the many) people who abhor the tedious process of flossing. 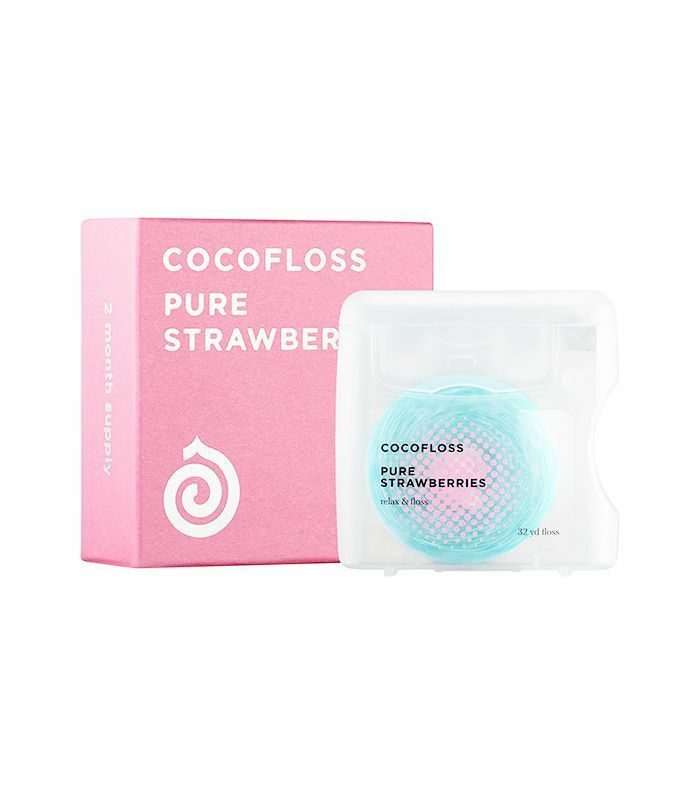 But with a fun hint of strawberry, super-soft consistency, and loofah-like technology which virtually scrubs away stains, this pick makes flossing, dare we say, fun. Next up: the best teeth-whitening pens for easy brightening.